I have been away for some time now, from blogging that is. I feel like I have fallen off the blogging world. 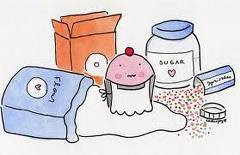 As most of you know I have recently opened up my cupcake bakery. It has overwhelmingly fantastic! I am so grateful for this amazing opportunity of living a dream. The store has been busier than we ever expected. It has been fun having so many friends and family stopping by for cupcakes and saying hello. Matt and the boys are busy, busy with school. Yes, all of them! matt is in his LAST semester. He will graduate in December. Can you say PARTY!!!! I am so excited for him! He has worked so hard the last 6 years and I know he will be super successful as a graphic designer, because he is good!! Ethan started 1st grade and he rides the bus now! He loves it. He has made new friends and is learning so much already. We had to go out and get him a SpongeBob lunch box, because he will not each school lunch. I thought it was cool to eat school lunch! Finn started pre-school and he feels so big. He loves doing what Ethan does. He even wanted the same back pack. If only he could ride the bus too. He is learning lots and having lots of fun being with kids his age. Truman is the next cupcake baker in the family. He hangs at the store and watches me bake. He is 6 months now and is rolling and scooting all over the place. This kid never stops smiling. He is such a cute baby! As for me, I bake 6 days a week and love every minute of it! My kids never have clean clothes, we never have food in the house and my car is a disaster, but I am happy!